Objective: To audit current UK practice of the management of severe sepsis in children against the 2002 American College of Critical Care Medicine/Pediatric Advanced Life Support (ACCM-PALS) guideline. Setting: 17 UK paediatric intensive care units (PICUs) and two UK PICU transport services. Participants: 200 children accepted for PICU admission within 12 h of arrival in hospital, whether or not successfully transported to a PICU, with a discharge diagnosis of sepsis or suspected sepsis. Main outcome measures: Medical interventions, physiological and laboratory data to determine the presence or absence of shock, inter-hospital transfer times, predicted mortality (using the Paediatric Index of Mortality, version 2 (PIM2) scoring system) and observed mortality. Results: 34/200 (17%) children died following referral. Although children defined as being in shock received significantly more fluid (p<0.001) than those who were not in shock, overall fluid and inotrope management suggested by the 2002 ACCM-PALS guideline was not followed in 62% of shocked children. Binary logistic regression analysis demonstrated that the odds ratio for death, if shock was present at PICU admission, was 3.8 (95% CI 1.4 to 10.2, p = 0.008). Conclusions: The presence of shock at PICU admission is associated with an increased risk of death. Despite clear consensus guidelines for the emergency management of children with severe sepsis and septic shock, most children received inadequate fluid resuscitation and inotropic support in the crucial few hours following presentation. Sepsis is a major cause of morbidity and mortality in children, with an estimated 42 000 cases per year in the United States, and an associated mortality rate of 10%.1 In the United Kingdom (UK), infection accounts for more than 10% of deaths in children <4 years of age2 and approximately 1000 children with severe sepsis are admitted to paediatric intensive care units (PICUs) annually.3 Up to 20% of children admitted to PICUs with severe sepsis die. In addition, each year, an unknown number of children die of septic shock in accident and emergency departments (A&Es) before reaching a PICU. One of the determinants of outcome is the adequacy of medical care before arrival in PICU.4 5 The 2002 American College of Critical Care Medicine/Pediatric Advanced Life Support (ACCM-PALS) consensus guideline6 and the 2009 update, currently in press,7 on the treatment of septic shock in children recommend early recognition, generous fluid resuscitation, cardiovascular support, antibiotic therapy and source control in addition to therapeutic strategies once the child is admitted to PICU. In relation to pre-PICU fluid and inotrope management, the 2002 ACCM-PALS guideline and the 2009 update are almost identical, other than a recommendation to start peripheral rather than central vasoactive agents in the 2009 update. The Advanced Paediatric Life Support (APLS) algorithm for septic shock,8 commonly in use in A&Es in the UK, is also almost identical to the first half of the 2002 ACCM-PALS guideline (fig 1) but addresses A&E management only. 2002 ACCM-PALS clinical practice parameters for haemodynamic support of paediatric and neonatal patients in septic shock.6 ACCM-PALS, American College of Critical Care Medicine/Pediatric Advanced Life Support; A&E, accident and emergency department; ECMO, extracorporeal membrane oxygenation; MAP-CVP, mean arterial pressure-central venous pressure; PDE, phosphodiesterase; PICU, paediatric intensive care unit; ScvO2, central venous oxygen saturation. The purpose of this study was to audit current emergency management of severe sepsis in children in the UK against the 2002 ACCM-PALS guideline, with a particular emphasis on the use of fluids and vasoactive drugs. Such information is vital for the planning of future randomised controlled trials of early interventions in severe sepsis. This was an observational study of pre-PICU emergency medical care in the UK, with data collected by 17 PICUs and two PICU retrieval services (listed in Acknowledgements) over a 6-month period between December 2006 and May 2007. Any child accepted for PICU admission within 12 h of arrival in hospital, whether or not successfully transported to PICU, with a provisional diagnosis of sepsis, was eligible for inclusion in the study. Sepsis was defined as a systemic inflammatory response syndrome “in the presence of, or as a result of, suspected or proven infection”, using the definitions proposed by Goldstein et al9 (box 1). Children in whom sepsis was not a discharge diagnosis were excluded from the final analysis. This procedure ensured that children with an alternative diagnosis (eg, cardiorespiratory collapse due to cardiac pathology, a metabolic disorder or uncomplicated bronchiolitis) were not included in the final analysis. Infection is defined as suspected or proven (by positive culture, tissue strain, or polymerase chain reaction test) infection caused by any pathogen OR a clinical syndrome associated with a high probability of infection. Evidence of infection includes positive findings on clinical examination, imaging or laboratory tests (eg, white blood cells in a normally sterile body fluid, perforated viscus, chest radiograph consistent with pneumonia, petechial or purpuric rash, or purpura fulminans). Information collected included details about interventions performed before PICU admission, tracheal intubation and mechanical ventilation, use of intravenous fluids, and use of vasoactive agents. Laboratory data recorded included white blood cell count, platelet count, blood glucose and C-reactive protein (CRP) on presentation to A&E. Lactate and extracellular fluid base deficit were recorded, when possible, on presentation, on arrival of the PICU transport team and on admission to the PICU. Inter-hospital transport time was also recorded, defined as the time between presentation in A&E to the time of arrival in the PICU. Physiological data were collected at two time points: at the time of referral to PICU and on arrival in the PICU. Shock at the time of referral was defined as either: (1) hypotension (systolic blood pressure less than the fifth percentile for age, using the PALS formula)10 or (2) requirement for vasoactive drugs; or (3) in the absence 1 or 2 above, at least two of the following three criteria: base excess <−5 mEq/l, lactate >3 mmol/l or capillary refill time >3 s. Shock at the time of PICU admission was deemed to be present if criteria 1 or 3 were present, irrespective of whether vasoactive drugs were being administered. Reversal of shock by the time of PICU admission was deemed to have occurred if shock at the time of referral had resolved by the time of PICU admission, regardless of the use of vasoactive drugs. Severity of illness was scored using the Paediatric Index of Mortality, version 2 (PIM2) scoring system.11 PIM2 data were available for all but three patients, who died before the PICU transfer team arrived. Outcome data included mortality, need for mechanical ventilation, inotropic support, renal replacement therapy (RRT) and extracorporeal membrane oxygenation (ECMO). Data were anonymised and collected prospectively by the investigators using a web-based data collection tool specifically developed for the project (Dataphiles, Leeds, UK) and transferred into a Microsoft Access database for further analysis. A&E and PICU transport team management were audited against the 2002 ACCM-PALS guideline, which was the standard guideline in use by PICUs and PICU transport services in the UK. However, as APLS is the standard algorithm in use for paediatric emergencies in many UK A&Es, this has been taken into account. Although the first part of the 2002 ACCM-PALS guideline is almost identical to the APLS algorithm, there are three minor differences. Firstly, the APLS recommends either dobutamine or dopamine as a first line inotrope, whereas the 2002 ACCM-PALS recommends dopamine. Secondly, the APLS recommends adrenaline as the standard second line inotrope, whereas the 2002 ACCM-PALS recommends noradrenaline for warm shock and adrenaline for cold shock. Therefore, dopamine/dobutamine and adrenaline/noradrenaline were considered as paired equivalents for the purposes of this audit. Patients were scored as dobutamine/dopamine refractory if they failed to respond to either of these agents as first line inotropic therapy and as catecholamine (adrenaline/noradrenaline) refractory if they failed to respond to either of these agents as second line inotropic therapy. Thirdly, steroids are not recommended in the APLS algorithm, whereas they are recommended for refractory shock in the ACCM-PALS guideline. As the routine use of steroids for inotrope resistant shock is now controversial, we audited the use of steroids separately. Data were non-parametric and are presented as median and interquartile range (IQR). The Mann–Whitney U test was used to compare independent samples. Statistical significance was defined as p<0.05. The χ2 test was used to compare proportions. Binary logistic regression was used examine factors influencing survival. The software used for statistical analysis was SPSS 16.0 (SPSS, Chicago, IL, USA). The study was registered with the Great Ormond Street Hospital NHS Trust Audit Committee. It was deemed not to require research ethics committee approval as data were anonymised by removing all patient identifiers. Data on 235 children were collected. Thirty five children were excluded from the final analysis, either because they did not satisfy the inclusion criteria or because the discharge diagnosis was not sepsis. Of the 200 remaining children, 116 (58%) were male. The median age of the whole group was 13.6 (IQR 2.9–39.4) months. Overall, 108 (54%) children had a positive bacteriological culture or polymerase chain reaction (PCR) test result for bacterial pathogens. Thirty two (16%) children had a viral infection identified by culture, immunofluorescence testing or PCR (table 1). The median inter-hospital transport time for the whole group was 7.6 h (IQR 5.3–11.7). By the time of inter-hospital transfer, or following PICU admission, 184 (92%) children were mechanically ventilated, 138 (69%) had received inotropic support, 24 (12%) had received RRT, and eight (4%) had received ECMO. Sixteen (8%) children received steroid therapy for shock, with nine of these at low “replacement” doses for shock (1 mg/kg, 6 hourly) and seven at a higher dose. Thirty four (17%) children died following referral, of whom seven died before reaching PICU and 27 died following PICU admission (fig 2). The median predicted mortality from PIM2 score for the whole group was 10% (IQR 5–16). Although this gives a standardised mortality ratio for the whole group of 1.7, the difference between observed and expected mortality was not significantly different in this population (p>0.1, using the method of JD Flora12). Flow diagram of outcomes. PICU, paediatric intensive care unit. Overall, 139/200 children had signs of shock at the time of referral to PICU. Of these, 53 (38%) reversed shock by the time of PICU admission and 83 (60%) failed to reverse shock or died by the time of PICU admission. In three children, the response to therapy was not classifiable due to missing data. The remaining 61/200 children did not have signs of shock at the time of referral to PICU. However, of these, 24 (39%) developed signs of shock by the time of PICU admission. In the group of 139 children who were shocked at referral to PICU, those who achieved shock reversal were younger (p = 0.02, Mann–Whitney U test) and had higher platelet counts (p<0.001) when compared to the group who failed to reverse shock. However, white cell count, CRP, glucose, PaO2/FiO2 ratio, predicted mortality and inter-hospital transfer times were not significantly different between the group which reversed shock and the group which remained shocked (table 2). Those children who failed to reverse shock received more fluid overall (p = 0.004, Mann–Whitney U test) and more fluid before the arrival of the PICU team than those in whom shock was successfully reversed (p = 0.05, Mann–Whitney U test). However, there was no significant difference in the volume of fluid administered after the arrival of the PICU team (p = 0.08, Mann–Whitney U test). 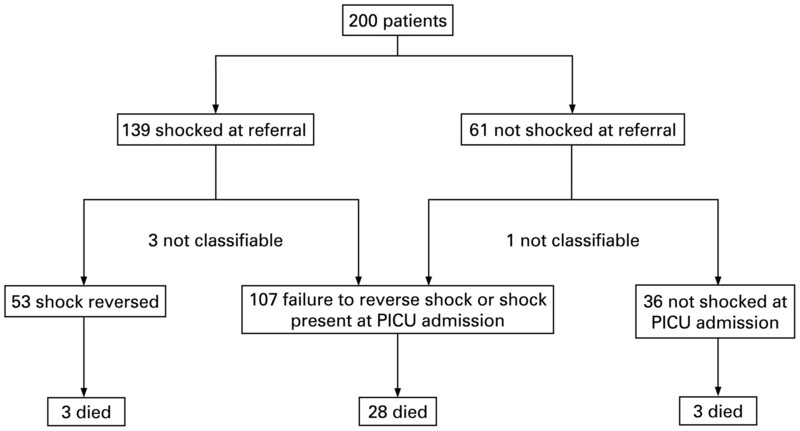 Those in whom shock was reversed had better outcomes than those in whom shock was not reversed: 3/53 (6%) died in the group which reversed shock compared to 21/83 (25%) in the group which remained shocked (χ2 p = 0.003). Three out of 53 (6%) in the group which reversed shock required RRT compared to 16/83 (19%) in the group which remained shocked (χ2 p = 0.02). Binary logistic regression analysis was performed, excluding the seven patients who died before PICU admission, with death in PICU as the outcome and using the following predictors: total fluid given, inotrope use during transfer, shock at time of PICU admission, and duration of inter-hospital transfer. The only variable associated with the outcome, death in PICU, was the presence of shock after inter-hospital transfer (p = 0.008). The odds ratio for death in PICU if shock was present at PICU admission was 3.8 (95% CI 1.4 to 10.2). Were the recommendations of the 2002 ACCM-PALS guideline followed? Patients with cardiovascular dysfunction were classified according to their response to therapy as follows: fluid responsive, fluid refractory, dopamine/dobutamine refractory and catecholamine (noradrenaline/adrenaline) refractory. For this analysis, the 107 children who developed shock, failed to reverse shock or died by the time of PICU admission have been defined as the “shock” group. Of these, 21 (20%) were not given ⩾60 ml/kg fluid despite persisting signs of shock, 16 (15%) were given ⩾60 ml/kg fluid but were not given dopamine or dobutamine despite having fluid refractory shock, 25 (23%) were dopamine- or dobutamine-refractory but were not given catecholamines (eight of these had also not received ⩾60 ml/kg fluid), 32 (30%) were catecholamine-refractory but were not given replacement hydrocortisone (seven of these had not received ⩾60 ml/kg fluid) and two were given intravenous hydrocortisone but were not started on vasoactive drugs before hydrocortisone. Overall, medical management followed the 2002 ACCM-PALS guideline in 9/107 (8%) children in the “shock” group. Even if the failure to commence steroids is disregarded, early medical management followed the 2002 ACCM-PALS guideline in only 39/107 (36%) children in this group. Interestingly, 24/107 (22%) patients in this group were not shocked at referral but developed shock by the time of PICU admission. None of these patients were managed according to the 2002 ACCM-PALS algorithm, suggesting that signs of evolving shock in this group were not detected by either the referring team or by the transferring PICU team. The principal finding in this audit is that the 2002 ACCM-PALS guideline was not followed in the majority of children who were shocked. The failure to follow the algorithm resulted most frequently from inadequate fluid resuscitation, inadequate use of vasoactive agents, or both. Our study also found that the presence of shock at the time of admission to PICU is independently associated with death. However, in contrast to previous studies, those patients who failed to reverse shock present at the time of referral received more total fluid than those who had shock reversed by the time of PICU admission. There are three possible explanations for the observation that shock is not reversed despite increased fluid administration. First, children may be presenting too late for treatment to be effective, that is, they may be presenting with irreversible shock. This is unlikely to be the case as survival to PICU discharge was 77% in the group who remained shocked at the time of PICU admission, suggesting that shock was successfully reversed after PICU admission in those who survived. Second, the hypothesis that generous fluid administration improves outcome may be incorrect, although again, this is unlikely, given the weight of evidence to the contrary. The third, and most likely, explanation is that although total fluid administered in our study was higher than that observed in previous studies, the rate and volume of fluid administration in the critical first hours may still have been inadequate to influence outcome. Unfortunately, this study did not identify the exact timings of each fluid administration so it is not possible to answer this question with certainty. The use of normal saline as the preferred first line resuscitation fluid in A&E followed by a mixture of other fluids, including saline, albumin, gelofusin and other blood products (fig 3), also highlights the lack of clear evidence regarding the most appropriate fluid for resuscitation of children with severe sepsis. Type of fluid administered before and after the arrival of the PICU team. (A) Before arrival of PICU transfer team. (B) After arrival of PICU transfer team. FFP, fresh frozen plasma; HAS, human albumin solution; PICU, paediatric intensive care unit; Plts, platelets; RBC, red blood cells. Overall, adherence to the 2002 ACCM-PALS guideline was poor, with only 8% of children in the “shock” group receiving management according to the guideline, either because of failure to give adequate fluid or inotropic support or failure to initiate maintenance hydrocortisone in those who did not respond to volume expansion or catecholamines. In septic shock, aggressive fluid administration for shock reversal, with up to 60 ml/kg or more in the first hour, is associated with improved outcome. Failure to reverse shock is associated with a doubling of the risk of death with each hour of persistent shock. The targets of the 2002 ACCM-PALS guideline for fluid administration and other interventions were not achieved in the majority of children with septic shock. The reasons why children with septic shock are under-resuscitated are unclear and need further investigation. Replacement hydrocortisone therapy was suggested for catecholamine resistant shock in the 2002 ACCM-PALS guideline as there was some evidence to support this practice at the time it was published. Following the publication of the CORTICUS study, the role of steroid therapy in septic shock is less clear,16 although the 2009 guideline is unchanged in this regard. However, even if the failure to give replacement steroid therapy is ignored, still only 38% of children in the “shock” group were managed according to the ACCM-PALS guideline. Ninis et al identified three factors associated with an increased risk of death in paediatric meningococcal sepsis in the UK: failure to be looked after by a paediatrician, failure of adequate supervision of junior staff and failure to start inotropic support.5 Our study concurs with the findings of Ninis et al, demonstrating that both fluid and inotropic support were often not given in a timely manner to children with septic shock. Although our study was not designed to determine what factors might be contributing to inadequate therapy, one factor may be that the 2002 ACCM-PALS guideline recommended not giving vasoactive agents until central vascular access was obtained. This was because of concern that administration of peripheral vasoactive agents could result in tissue injury. The 2009 update now recommends use of peripheral inotropes (not vasopressors) to avoid delay, until central access is obtained. Whatever the contributing factors are, complex monitoring techniques are not necessary for the early management of children with severe sepsis and septic shock. Monitoring of clinical and laboratory endpoints, and application of a simple clinical algorithm to guide management could bring about significant improvements in mortality for this group of patients. The major limitation of this study is that 100% case ascertainment is unlikely to have been achieved. The UK Paediatric Intensive Care Audit Network (PICANet) data for the study period shows that 482 patients were admitted to UK PICUs with diagnostic codes consistent with sepsis during the time period of the study (Roger Parslow, PICANet, personal communication, 2008). Although 120 of these cases were admitted directly from A&E, the number admitted within 12 h of presentation to A&E is not recorded in the PICANet dataset and some cases may have been moved to other areas by the time of referral to PICU. However, since many of the cases in the PICANet database are cases of nosocomial sepsis, rather than acute sepsis referred within 12 h of arrival in A&E, it is likely that the 200 cases in our audit represent the majority of PICU admissions with community acquired sepsis during the study period. In spite of the lengthy period between arrival in A&E and arrival in PICU, the targets set by the 2002 ACCM-PALS guideline for fluid administration and inotropic support were not achieved in the majority of critically ill children with septic shock. Such children, as a group, are under-resuscitated. Failure to reverse shock by the time of PICU admission was independently associated with mortality. The reasons for clinicians failing to follow simple algorithms for resuscitation are unclear and need further investigation. We thank M Marsh and colleagues in the PICS council for the generous support of the Paediatric Intensive Care Society. We thank our participating centres and investigators: Addenbrooke’s Hospital (S Morley and D White), Alder Hey Children’s Hospital (P Baines), Birmingham Children’s Hospital (K Morris), Bristol Children’s Hospital (S Marriage), Children’s Acute Transport Service (H Lang and J Sharma), Great Ormond Street Hospital for Children (M Peters and H Tighe), Hull Royal Infirmary (H Klonin and F Chinganga), Leeds General Infirmary (S Cooper), Leicester Royal Infirmary (J Whitelaw), Newcastle General Hospital (J Cassidy and I Johnstone), Royal Hospital for Sick Children, Edinburgh (U Thielen and T Weiss), Royal Manchester Children’s Hospital (P-M Fortune, V McLaughlin), Southampton General Hospital (P Wilson), South Thames Retrieval Service and Evelina Children’s Hospital (S Hanna), St George’s Hospital (M Gray), University Hospital of North Staffordshire (P McMaster) and University Hospital of Wales (R Al-Samsam).
. Scope and epidemiology of pediatric sepsis. Pediatr Crit Care Med 2005;6:S3–5.
. WHO estimates of the causes of death in children. Lancet 2005;365:1147–52.
. Paediatric Intensive Care Audit Network national report 2004–2005. UK: Universities of Leeds, Leicester and Sheffield, 2006.
. The role of healthcare delivery in the outcome of meningococcal disease in children: case-control study of fatal and non-fatal cases. BMJ 2005;330:1475.
. Clinical practice parameters for hemodynamic support of pediatric and neonatal patients in septic shock. Crit Care Med 2002;30:1365–78. , eds. Advanced paediatric life support. 4th edn. London: BMJ Books, 2005.
. International pediatric sepsis consensus conference: definitions for sepsis and organ dysfunction in pediatrics. Pediatr Crit Care Med 2005;6:2–8.
. Paediatric advanced life support. Circulation 2005;112(Suppl 1):167–87.
. PIM2: a revised version of the Paediatric Index of Mortality. Intensive Care Med 2003;29:278–85.
. A method for comparing survival of burn patients to a standard survival curve. J Trauma 1978;18:701–5.
. A comparison of albumin and saline for fluid resuscitation in the intensive care unit. N Engl J Med 2004;350:2247–56.
. Hydrocortisone therapy for patients with septic shock. N Engl J Med 2008;358:111–24.
. Early goal-directed therapy in the treatment of severe sepsis and septic shock. N Engl J Med 2001;345:1368–77.
. ACCM/PALS haemodynamic support guidelines for paediatric septic shock: an outcomes comparison with and without monitoring central venous oxygen saturation. 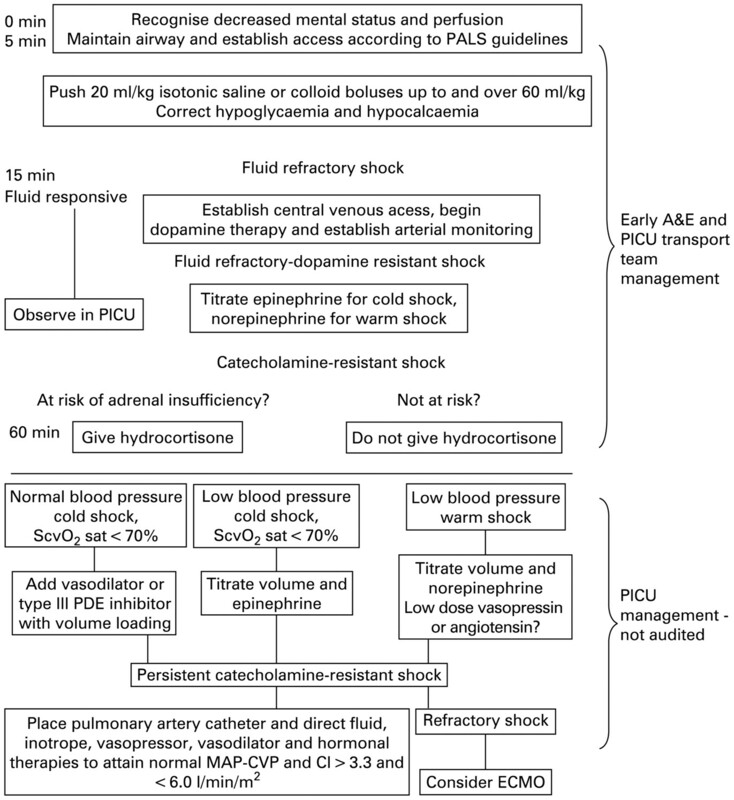 Intensive Care Med 2008;34:1065–75.
. Back to basics in septic shock. Intensive Care Med 2008;34:991–3. Funding: This study was supported by grants from the Paediatric Intensive Care Society and Children of St Mary’s Intensive Care. Dr Inwald is also grateful for support from the NIHR Biomedical Research Centre funding scheme. The funding agencies had no role in study design, data management, analysis or manuscript preparation.